Elephant Head Rock alias Hin Pusa lies 1.5 km located in open water to the south of Similan Island 8 (Koh Similan). It is the biggest and probably the second most-recognizable pinnacle in the Similans. There are three large boulders that emerge above water, with the biggest one located in the west. The Surface rocks look like a bathing elephant when approached from the west, hence the name. The huge boulders that form Elephant Head Rock create a maze of swim-throughs, sheer walls, arches, caverns, gullies and tunnels – great places for marine life to hide, and great places for divers to discover! 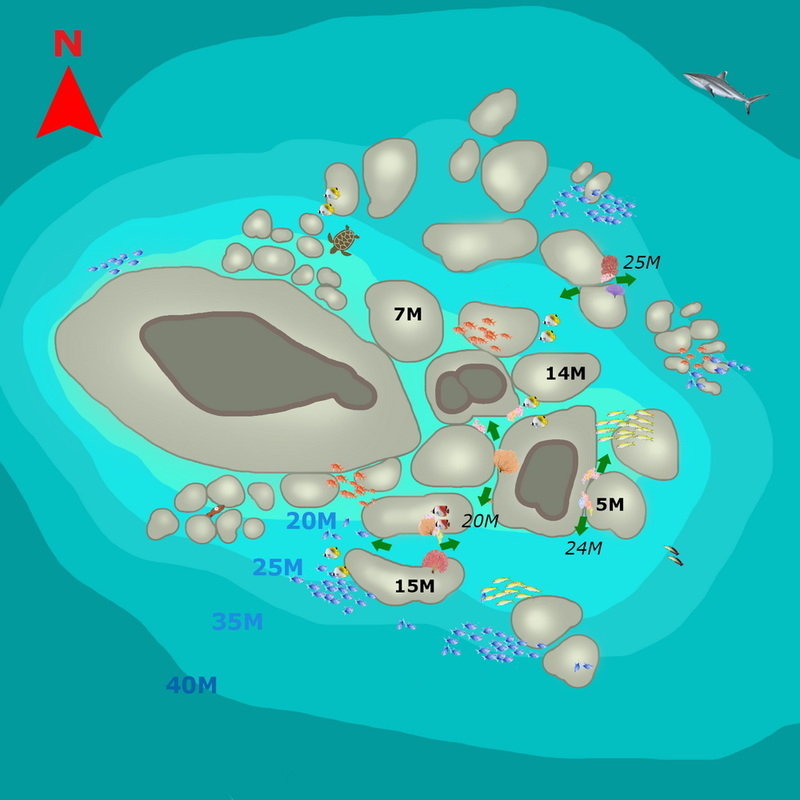 The dive site at Elephant Head Rock is surrounded by sand at a maximum depth of 35-40 meters. Being so exposed it offers excellent visibility in its deep waters. You do need to be careful of your decompression time. Many divers find Elephant Head the best deep boulder dive of the Similan Islands chain. Elephant Head Rock is a huge dive site to explore. It has no mooring line; divers must make a free descent. Before commencing descent agree on a reference point so nobody drifts away from the group. Use the current to “free ride” its tunnels and swim-throughs which are literally littered with soft corals and sea fans. Sea fans feed on micro-organisms in the passing currents and are rarely disturbed by human activity, enabling them to grow large and healthy and live long. Thousands of marine fish and invertebrates make it their feeding ground, or somewhere to hide during the day. It feels like swimming in an underwater valley, it is very popular with underwater photographers. Most swim-throughs and channels are above 24 m. Explore under and between the rocks and cracks to spot juvenile white tip reef sharks and possible stingrays. The center and the eastern parts of this site offer the best scenery. To the west of the giant rock there is a sheer wall that falls to a depth of 40 meters and corals are hardly present. Sometimes it has a down current so best avoided for not so experienced divers. Great Barracudas, Giant Trevally, Angelfish, surgeonfish, Fusiliers and Rainbow Runners are commonly found in mid water. Divers may encounter sweetlips and Big Snappers in cracks, holes and swim-throughs. Rockmover wrasse and clown anemone fish keep it close to the rocks. The smaller critters such as cleaner shrimp and boxer shrimps as well as Octopuses are living here as well. Various species of Moray Eels can be seen sticking their heads out of holes and crevices in the rocks and corals. Turtles sometimes pay a visit to munch on coral at medium depths here, so keep an eye out for them. In deeper areas purple fire goby can be found. 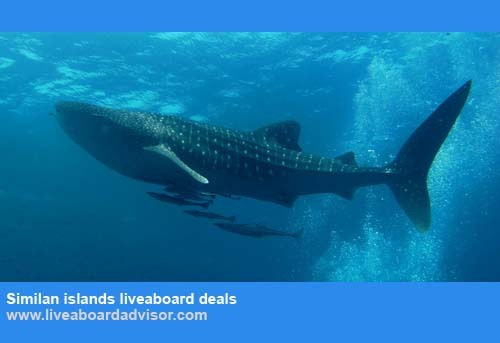 There is plenty to see here at Elephant Head rock, even Manta Rays or Whale Sharks pay visits from time to time, especially at the end of the diving season. It has its reputation for spin-cycle like currents running in every direction and the surges are often unpredictable between the rocks which make this place an experienced diver’s site. To avoid coral damage and entanglement, enter the swim-throughs in single file. Because of its popularity be aware of surface traffic and ascend away from the rocks using a surface marker. Rather a more demanding site, Elephant Head Rock is all in all one of the best scuba diving sites in the Similan Islands. 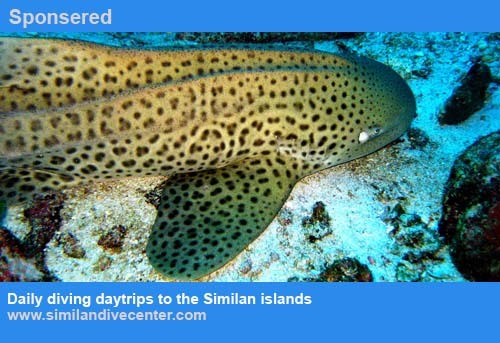 It is schedules by liveaboard cruises or speedboat day trips.